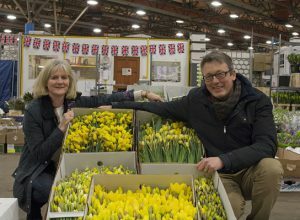 Throughout March Chez Fleur will be selling daffodils to support the Marie Curie Great Daffodil Appeal – you can buy our specially wrapped British daffs and narcissi next Saturday 10 March at Cuckfield Local market or The Bay Tree pop up (and at Hurst Prep school on Friday 9 March) just in time for Mother’s Day – a great little gift for Mum and a charity donation at the same time. Win win! The pic above was taken with Shane Connolly (who did the fab’ flowers at the wedding of Prince William & Kate Middleton!) and me at New Covent Garden market – very early one morning! !